The little prince is close to the asteroids 325, 326, 327, 328, 329 and 330. So he visits these asteroids first. He wants to be busy. He wants to learn something. There is a king on the first planet. The king has nice clothes. He is sitting on a big chair. “Ah! Here is a visitor,” the king says when he sees the little prince. “Come closer to me. I want to see you better,” says the king. He is very proud that he is a king for somebody now. The little prince looks around. He needs a place where he can sit down. But the king’s clothes are on the whole planet. So the little prince is standing. And because he is tired, he yawns. The little prince wants to yawn for the king. But he can’t do it now. He says, “I am sorry. I can’t yawn when you tell me to do it,” says the little prince. The king is not happy because people must do what the king says. But, because he is a very good man, what he wants is reasonable. “Can I sit down?” the little prince asks. “I order you to sit down,” the king says. And he pulls a piece of his clothes so that there is some space where the little prince can sit down. The little prince is thinking about one thing. The planet is very small. The king doesn’t control much. “Can I ask you a question?” says the little prince. “I order you to ask me a question,” the king says. “I control everything,” says the king. The king looks at his planet. Then he looks at the other planets, and all the stars. 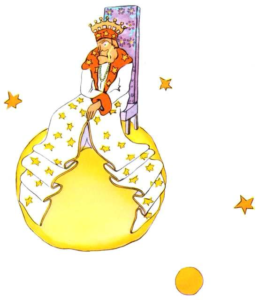 “Are you the king of all?” asks the little prince. “I am the king of all,” says the king. He doesn’t control only his planet. He is the king of all the universe.